Hello, lovelies! 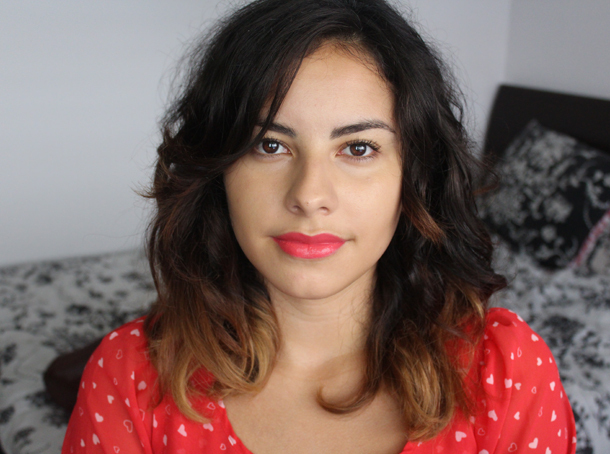 Today I’m featuring the lipstick I wore on my Messy Waves and Bright Lips post. This was gifted to me by Latasha during a makeup swap. Otherwise I would have never gotten my hands on this. This lipstick is part of the recent Bourjois Rouge Edition Lipstick collection. I’ve seen a few bloggers review the entire lipstick line so you can look for swatches online if you’re interested. If you’re from the U.S. you will probably have to track this online as Bourjois products aren’t sold there. Fraise Remix has a shiny, creamy formula. It feels nice on the lips and isn’t drying. It’s quite bright so keep in mind that it might accentuate lip imperfections. I don’t usually love really shiny lipsticks but I think the finish works perfectly with Fraise Remix. It gives a juicy appearance. The color is a bit complex. When I first opened the tube I thought it was a strawberry/poppy red. I then swatched it on the back of my hands and thought it looked pink. On my lips it sometimes looks coral or slightly orange. As you can see in the image below, it matches my orange shirt perfectly. My conclusion is that it looks different depending on your skintone and the lighting. I love this lipstick shade and am so grateful Latasha picked it out for me. I guess the raves for the Bourjois Rouge Edition line are well deserved. I love these lipsticks! The formula is just perfect. I have it in the shade Rouge Jet Set, but I'm pretty sure I'll end up buying a few other shades as well. P.S. If you ever need anything from Bourjois, just let me know and I'll send it to you. This is one of those rare brands we actually do have here, haha. This lipstick looks absolutely beautiful! This looks amazing on you Coco, you gorgeous girl! It does look so different on, but I love it! It's a very pretty and unique colour. That's a gorgeous colour on you! I have one lipstick from this range and I would really like more as I think they are really good. However, Bourjois have a new range coming out later this month so I will probably hold out for one of those as they will be new and a little bit exciting. Beautiful the shade is really pretty! This looks beautiful. I love how it looks fairly moisturising too, won't be so bad on my dry lips. Seriously, this lipstick was MADE for you Coco!! Bourjois should hire you as their lipstick model and have you wear this in advertisements; everyone would buy it! 😉 And I absolutely adore lipsticks that shift depending on what you're wearing, what your skin tone is, etc. Makes them so multifaceted and good for most any occasion! It looks really pretty! You chose a great colour! Such a beautiful colour and the forumla sounds lovely too! This looks gorgeous on you! I've got around 4 of these and really like them. I agree they can show imperfections but fortunately my lips are in reasonable condition at the moment. I've not seen this shade for some reason but it's beautiful and I need to get my hands on it! This color looks great on you. Too bad it isn't sold in the States. I love the warmth of this color, it even has a vibrant pop that makes it such a good statement summer lippie! What a beautiful shade and the formula looks great, too!